There is only a limited research actives in campus. While our research group (a.k.a G’s research group) is still small, we are not in the position to say anything. But, Dr. G always encourages us to apply for more research funding to expand the group. You have chicken and you will have eggs. Once you have eggs, you have more chickens. 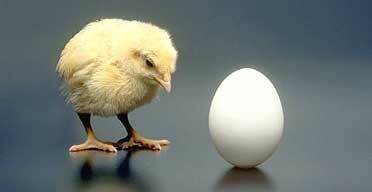 He said, it is just like an chicken and egg. You have chicken and you will have eggs. Once you have eggs, you have more chickens. Meaning, once you have funding, you’ll get RA. Subsequently, you will have more research outputs and you can get another round of research grant. At the same time, G’s research group will expand and we will have more research activities. There are two reasons that I reluctant to apply. First, I am working on network traffic and it relies heavily on the network simulator (I presume). Yes. I do need to collect network traffic data from the networking department but I don’t think I need a specify router just for data collection. Perhaps I should request the fund be spent on the software investment e.g. OPNET and Qualnet? But, honestly, I prefer to run my own network simulator, which is much more “tractable”. Secondly, it’ll sacrifice my “bachelor life” in research (i.e. the responsibility ….). u can just say u wanna router to realise ur work, as a tool for proof of concept. For the software, u can just say they are standard tools used by world researchers, and so ur result will be standard. The panel not really know networking i think, a few jargon can scare them away? hah, it is just depend on u if u wanna make it success or not. i don’t understand the meaning of ur secondly?